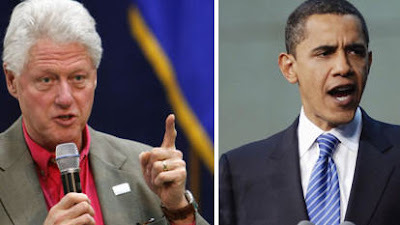 What did it take for Senator Obama to finally give 'props' to President Bill Clinton? Why just a complete financial market meltdown, a proposed seven hundred billion bailout, and some tight polls! This blogger, to his amazement, just saw Senator Obama on the stump in Green Bay, WI, singing the praises of Bill Clinton - the growth in family income, the shrinking of the federal budget deficit, etc., etc. "... That, I believe, is the unforgivable insult. The Clintons picked up on this slight well before Obama made it explicit with his observation that Ronald Reagan had "changed the trajectory of America in a way that Richard Nixon did not and in a way that Bill Clinton did not..."
"... But any sense of personal pique masks a substantive argument that weighs against including the former president. During the primary, Obama repeated over and over the need to “turn the page” on decades of political division — decades which pointedly included the 1990s, regarded by Clinton’s camp as a golden era of peace and prosperity. Obama at times attacked more directly. In one mailing shortly before the Feb. 5 Super Tuesday primaries, Obama summed up the political impact of the Clinton presidency. “Eight years of the Clintons, major losses for Democrats across the nation,” the mailing said..."